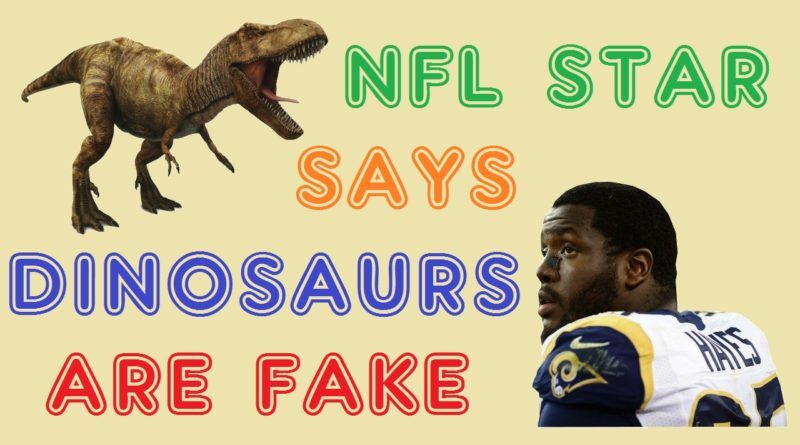 NFL star William Hayes says dinosaur bones were planted there, but is this really how dinosaurs are discovered? Just because Wikipedia said sue found them doesn’t mean it really happend. Hi Richard, thank you for taking the time to register and post. I agree with your comment 100%. Any objective, sane, reasonable person would detect some large problems with the official story regarding Sue and her ‘T-Rex’. My video was intended as a parody of another well-known YouTuber. How do we know that is not just a story written? I would like to hear an account from someone that is not a Paleontologist who found a dinosaur fossil, someone who gained nothing. When you research this topic you will become aware that most dinosaur fossils were named and found early on have since been proven hoaxes. I ask why give any credence to any of their work or what they say? Do you believe in fossil fuel too? I have some moon rocks Buzz Aldrin gave to my uncle back in 1972 (three of them) I know they are real because they are rocks and I have a picture o my uncle shaking hand with Buzz that later he had signed then framed all of it in a glass case. What I am trying to convey is though I have a good story and tangible evidence, I really have a picture and some rocks with a great story (one my uncle believed until he passed away). One i am not so sure of any longer! Thanks for signing up and posting your thoughts, Mike. If you are new to my work you may not be aware that I am the world’s preeminent dinoskeptic, currently investigating what I call the ‘dinofraud’. Long story short, I do not believe ‘dinosaurs’ ever walked the earth. This video was a pisstake, a parody of a well-known YouTube ‘truther’ named TeamWakeEmUp (or, alternatively, RedSilverJ). If you are also skeptical of dinosaurs, you have come to the right place. What i find amusing is, it was found in the city of FAITH, maybe you have to have faith to believe it. By the way and i didn’t know this for a long time that archeology isn’t a science. That is very interesting. It goes without saying that I don’t personally consider archaeology to be scientific (in the sense of the scientific method), but I was not aware that even within academia archaeology is not considered a science. This thread on scienceforums.net is both amusing and informative. Ha ha ha ha… you actually kept up the American Black schtick the entire video… that was hilarious. I enjoy that almost as much as when a black guy mimics a white guy. I went round and round about this Dinosaurs are fake issue with a guy on FarceBook recently… typically, he put up the same arguments they all do for any issue we face… “Oh, i suppose they are all liars, then.” and the like, we’ve all heard them. We are still “friends” but i have no idea if i convinced him or not. I can’t tell if he’s on there to waste my time or not, so that’s fair. He told me he wasn’t sure he could trust me, and i told him to keep an eye on me and call me out anytime he thinks i am flipping spit. He does keep an eye on me… even gets my back sometimes on certain topics. All we can do is try… all we can do is change one mind at a time. Thanks for the kind words. I am not sure if you are familiar with TeamWakeEmUp aka RedSilverJ; I’m trying to impersonate him for these GreenSilverJ videos. I intend to make it a semi-regular series which will eventually fill its own playlist. As for dino-believers, who can blame them? they were told at a very young age that it was okay to believe in gigantic dragons, so long as they believed in science’s gigantic dragons. You are basically trying to kill Santa for full grown adults. I hope you dont mind if i continue a little about Archeology. It was hard to find any History on when it became a science, if it did. They call it a science today. “The exact origins of archaeology as a disciplined study are uncertain. “In America, Thomas Jefferson, as he reported in his “Notes on the State of Virginia” by Jefferson (completed in 1781), supervised the systematic excavation of an Native American burial mound on his land in Virginia in 1781, (or perhaps slightly earlier). Although Jefferson’s investigative methods were ahead of his time (and have earned him the nickname from some of the “father of archaeology”), they were primitive by today’s standards. He did not simply dig down into the mound in the hope of “finding something”; he cut a wedge out of it in order to examine the stratigraphy. The results did not inspire his contemporaries to do likewise, and they generally continued to hack away indiscriminately at the deposited remains of ancient settlements, – ( aka “tell” sites), in the Middle East, at barrows and tumuli in Europe, and at ancient mounds in North America, destroying valuable archaeological material in the process. I might be incorrect here but … did Archaeology become a science as late as 1920? This is my first time trying to piece things together.. hope I didn’t stuff it up. Sue Hendrickson and Peter Larson’s discovery of the dinosaur called “Sue”. “An ownership dispute involving the institute, the rancher and the tribe arose. This caught the attention of the U.S. Attorney’s office in South Dakota, which was already investigating allegations the institute had taken fossils from public lands. The National Guard carted Sue away from the Black Hills Institute in Hill City, S.D., prompting an outcry from residents of the town, where the institute planned to establish a museum displaying the dinosaur, according to an account in Steve Fiffer’s “Tyrannosaurus Sue” (W.H. Freeman and Company, 2000). The feds later slapped Larson, his colleagues and the institute with an array of charges related to collecting and selling fossils. None of the charges concerned Sue, and only a handful resulted in convictions. Thanks for taking the time to put all of that together. You certainly did not ‘stuff up’ with the post, although I have taken the liberty of tidying up some of the formatting. Generally the comments read better if each new quote is separated by a line of space, especially for longer posts like this one. It also makes it easier to follow if the quoted text is in italics. I was not aware of some of the background you have uncovered there, so I will now have to go and look into it further. The entire story about how they ‘found’ a 66 million year old dinosaur just lying around is obviously preposterous and insulting to any sane person’s intelligence, but I was not aware that Larson and Sue were (allegedly) romantic, nor was I aware Larson had been imprisoned. The plot thickens even further! As for ‘archaeology’, it seems we are supposed to believe that for thousands of years, humans had no interest in unearthing (or merely tripping over) ancient creatures and artifacts, until about 100 years ago when the entire world suddenly caught the archaeology bug. It is all so obvious now, isn’t it? Were it not for TV and school I would like to think I would never have fallen for such nonsense, even as a child. I have trouble sometimes with knowing how to put words together including punctuation etc, so you are very welcome to tidy up any post of mine. I didn’t use to be like this, I was once a “clever secretary” and fell victum to the “Black Dog” and at the time naturally was prescribed the “Happy pill”. After many years I found that i could hardly put a sentence together. I have never regained all my abilities.